With a gorgeous place like Sunset Beach to discuss, it does seem silly to be reporting on bathroom facilities. But, let's be practical here: Even in Paradise, when you gotta' go, you gotta' go! And it's nice to know that there's a nice, cool, clean, commodious place near the beach to . . . well, you know. That, together with the outdoor showers, helps a lot! So, during our most recent escape to Sunset Beach Bliss, when we headed for the sand and surf, I took a moment to take some snaps of the brand new facilities that have been added by the Town. And I must say, the two restroom facilities exceeded my expectations: baby changing surfaces, a family bathroom - and each room even has heat & air conditioning! 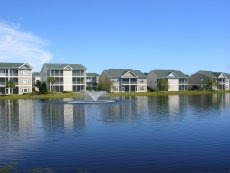 So here's one more reason for families to choose Sunset Beach for their Summer escape! A beautiful, natural and clean beach, with all the modern amenities that make enjoying yourself outside that much easier - particularly when there are children involved. Brilliant for Moms and Dads! one on each end of the parking lot near the public access. Notice the 3rd choice of restroom for families with kids! right by the Public Beach Access.